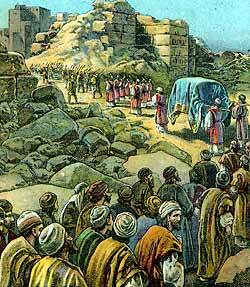 Jericho is captured after it’s walls come tumbling down. THE CHILDREN OFIsrael had now only to cross the River Jordan to enter the promised land of Canaan. Moses, for his sin at Meribah, or the waters of strife, where he struck the rock instead of speaking to it as he was told, had been forbidden to enter it with them. He was only allowed to see it at a distance, from the top of mount Nebo. So, by God‘s command, he appointed Joshua to be their guide and leader into it. After Moses had done this, he died, a hundred and twenty years old. Then God bade Joshua prepare to pass over the Jordan into the land He had promised to the Israelites. But, before they did so, Joshua sent two spies to the city of Jericho, which was fortified against them on the other side of the river. The people of the city were very much afraid of the Israelites, for they had heard what God had done for them from the time they left Egypt. So, when the King of Jericho sent men to take these spies prisoners, a woman of the city, in whose house they had lodged, hid them; and then begged, as her reward, that when the city should be taken, her life, and the lives of all her family, might be saved. The spies promised this; so then,, as she lived on the town wall, she let them down by a cord through the window, and they returned to the camp. When the people were about to pass over Jordan, the ark, in which were two tables of stones, was carried before them by twelve priests; and, as soon as they entered the river, its waters were divided, and all the multitude went over on dry ground. Then they encamped at Gilgal, before Jericho; and there God commanded that the armed men of the Israelites, with the priests carrying the ark, should on seven days go round the city, with trumpets sounding; and He told them that on the seventh day the walls should fall down before them. So each day, for six days, as they had been bidden, they went once round the city; but on the seventh day they went round it seven times, as God had said; and at the seventh time, when the priest blew a loud blast with the trumpets, Joshua bade the people shout, for the city was theirs. Then they gave a great shout, and the walls of the city fell down flat before them, so that they marched straight into it, and burned it to the ground. But Joshua remembered the woman Rahab, who had hidden the spies, and he brought her and her family in safety out of Jericho into the camp of the Israelites.